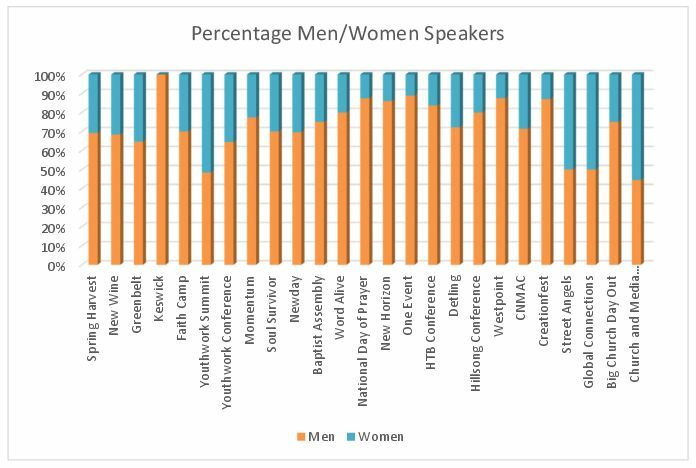 After the hoo-hah that began when “The Nines” Leadership Conference chose to have only 4 female speakers while having 110 male speakers, was brought to public attention yesterday by Rachel Held Evans yesterday, @jonathonmerritt, a US blogger collated the male and female speakers at various high profile US Christian conferences. Helen Austin (@helen_a13- the blogger formally known as Fragmentz) mentioned that it would be useful to have a UK version, so the two of us set about doing this, with some help from various people giving us suggestions of conferences to include. Where possible we’ve sourced the information about speakers from the online recordings after the events. Where that hasn’t been possible, we’ve looked at the contributors listed for future events. We have included the number of women and men who contributed, and the overall amount of presentations done by men and women (some speakers contribute multiple times). We’ve included married couples who spoke together as “couples” and have mentioned other interesting things like whether the women who are contributors are married to men who are also contributors. We were unable to gather any data on the Christian Resources Exhibition. Thanks to Hannah Mudge (@boudledidge) for helping with these charts! !